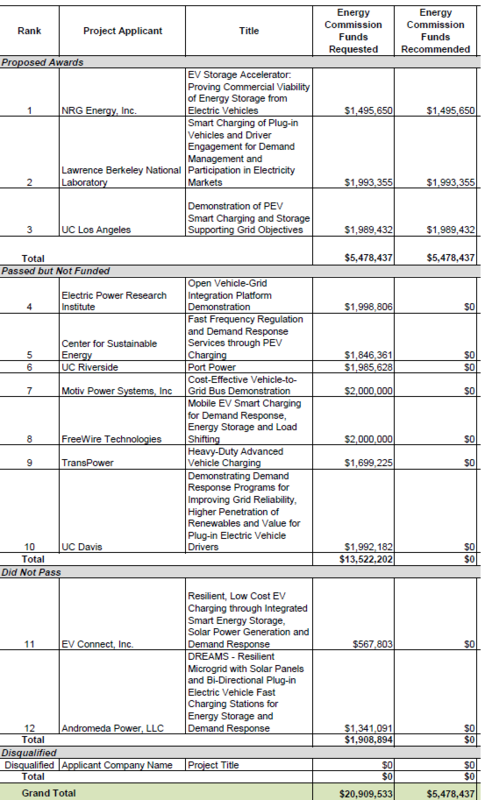 The California Energy Commission staff has recommended $27.3 million in funding for 10 microgrid and electric vehicle charging projects as a result of a competitive solicitation (PON-14-301). Announced February 3, the winners were among 40 projects that bid into a request for proposals by the November 17 deadline. The winners will provide more than $11 million in matching funds for the projects. 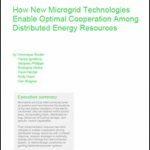 Microgrids won the bulk of the money; the remaining $5.5 million went to grid-linked charging stations. University of California, Los Angeles to demonstrate plug-in electric vehicle smart charging and storage to support the grid ($1.98M). 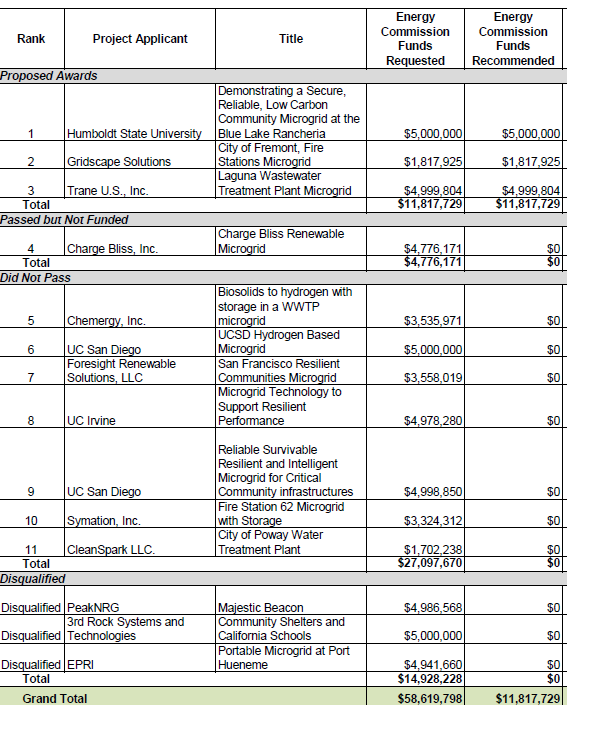 San Diego Gas & Electric, the only utility winner, received $4.7 million for a photovoltaic microgrid. Ingersoll Rand subsidiary, Trane, was awarded $4.99 million, with $2.2 million in matching funds for a microgrid at the Laguna Wastewater Treatment Plant. The city of Fremont, California plans to install a microgrid at a fire station, which received $1.8 million from a proposal submitted by Gridscape Solutions, an energy software and services company with offices in Fremont, the UK and India. Before the money is released, the awards must be approved by the CEC and funding agreements executed. Like Connecticut, New York and other states cultivating local energy, California offered the money to demonstrate the technology’s worth and encourage more private investment. Specifically, California sought low-carbon microgrids for critical facilities; high penetration renewable energy microgrids; and grid connected PV charging projects. 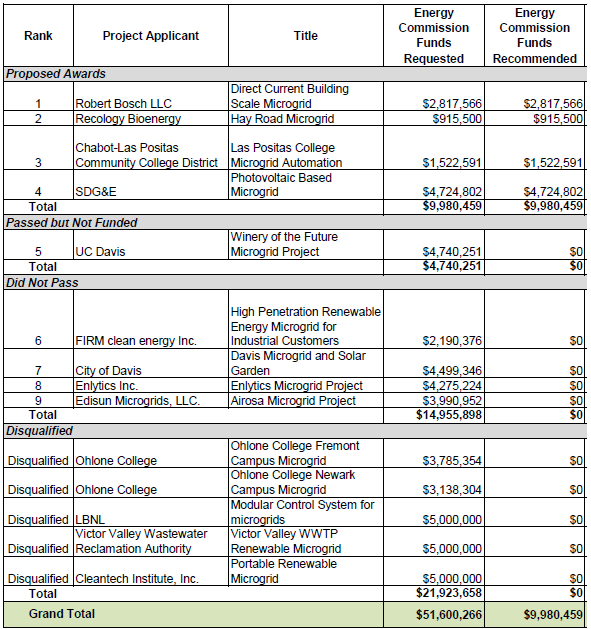 The commission hopes to achieve several goals through the grant program, such as identifying barriers to microgrid development and gaining better understanding of microgrid configurations that offer ratepayers highest value. Originally, California offered $26.5 million for the projects with funds from the Electric Program Investment Charge (EPIC). Later it added $776,625 to bring total funding to $27,276,625. Below is a listing from the commission of the winners and bidders. Track other microgrid proposals and grants by following us on Twitter @MicrogridNews. Je suis inventeur indépendant, j’ai 64 ans. J’ai imaginé un écomoteur dont j’aimerais pouvoir évaluer les performances, comme les capacités de production et le dimensionnement ? Le fait d’être indépendant et de ne pas posséder d’entreprise me prive des aides d’Etat pour avancer dans mes recherches. C’est donc pour cette raison que je fait cette offre de collaboration à celui ou à ceux qui voudront bien m’aider dans la réalisation de cet objet.